A tiny cylindrical space camera detached itself from Japan's new solar sail and snapped some photos of the mission bound for Venus and beyond in June 2010. Full Story. By rigging large pieces of cloth atop boats, early explorers harnessed the wind to voyage across oceans. Now, modern space explorers want to use sails to send spacecraft to the far reaches of the solar system and beyond. These sails will be made of large, ultra-thin plastic sheets that will be propelled using sunlight instead of wind. Light particles, or photons, exert a small pressure when they bounce off a reflective surface. Ever since Scottish physicist James Maxwell proved that light exerts pressure in the 1860s, space exploration visionaries have talked about solar sailing. Lately, exciting new developments are making their vision a reality. In May, the Japanese Space Exploration Agency successfully launched IKAROS, the first-ever spacecraft to use a solar sail for propulsion in space. The spacecraft finished unfurling its sail in June and is now traveling toward Venus under solar pressure. Two more solar sail launches are on the horizon: NASA plans to launch a sail this fall, while the non-profit Planetary Society is aiming for a launch in 2011. At the second International Symposium on Solar Sailing at the New York City College of Technology in July, 60 experts from around the world unanimously agreed that "solar sail technology is viable for space flight operations." The panel recommended speeding up development and testing the technology. "Solar sailing is the only known technology we have on Earth that will someday take us to the stars," said Louis Friedman, executive director of the Planetary Society. Sail-propelled spacecraft could be used to monitor Earth or hover close to the sun to study solar storms and flares, scientists say. They also could be used to adjust the orbits of satellites circling the Earth. But their true potential may lie farther away: Experts believe solar sails are the best propulsion system for exploring the outer edges of the solar system and someday other stars. That is because unlike rockets, these spacecraft don?t require fuel and they gain speed constantly as long as light hits them. Potentially, solar sails can move spacecraft much faster than a rocket engine could. "If you want to go really quickly to the outer edge of the solar system you?d want to use a solar sail," said Les Johnson, deputy manager of the Advanced Concepts Office at NASA?s Marshall Space Flight Center. "A chemical system [such as] a rocket would run out of gas long before you get there. With solar sails, as long as you?ve got the sun you can keep going.? Today?s solar sails are typically made of aluminum-coated plastic films only a fraction as thick as a trash bag. Other lightweight materials such as aluminum oxide or carbon fiber are also being tested. To capture as much pressure from sunlight as possible, sails need to be big. The Planetary Society?s Cosmos-1 prototype sail, which did not reach orbit due to a rocket failure, had a surface area of 6,500 square feet (600 square meters), about 1 1/2 the size of a basketball court. Going to the fringes of the solar system would require very large sails. Johnson imagines next-generation sails would have to be hundreds of meters on a side. They would be deployed close to the sun to gain thrust and build up immense speed so they could coast the rest of the way through the solar system. In three years, a solar sail could reach speeds of 150,000 mph (240,000 kph), scientists estimate. At that speed, it could reach Pluto in less than five years. It took NASA?s Voyager spacecraft over 12 years to reach a similar distance. The latest spacecraft to head toward Pluto, NASA?s New Horizons mission, will take nine years to reach its destination using a combination of rocket propulsion and gravity-assist maneuvers. Friedman believes that a sail-propelled spacecraft for exploring the Kuiper Belt region of space rocks on the fringe of the solar system is possible within the next 10 years. But beyond the orbit of Jupiter, the energy from sunlight gets too weak to keep sails accelerating, so to go beyond our solar system, a craft could need added thrust. For that, he says, light could be provided by a solar-powered laser placed in orbit around the sun at a mid-point within the solar system. NASA's first test of the concept of solar sailing came in 1974 with its Mariner 10 spacecraft, which was designed to fly by Venus and Mercury. When the craft?s direction needed to be changed and it had run out of gas for its jets, controllers turned its solar panels to face the sun and change the spacecraft?s direction with solar pressure. Between 2001 and 2005, NASA built two 66-foot (20-meter) sails that were successfully tested on the ground under vacuum conditions. But funding for the projects fell through in 2005 and they never flew. At about that same time, affordable compact nanosatellites called CubeSats appeared on the scene, presenting a low-cost opportunity to launch a solar sail. The result was NanoSail-D, a diamond-shaped sail 10 feet (3 meters) on a side that was made of four triangular blades and was packed into a 10-pound (4.5-kg) spacecraft about the size of an airplane carry-on bag. 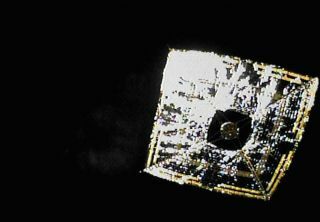 In 2008, NanoSail-D was launched aboard a SpaceX Falcon-1 rocket that failed to reach orbit. Scientists at NASA?s Marshall Space Flight Center in Huntsville, Ala. plan to try to launch NanoSail-D again this fall. Meanwhile, the Planetary Society is building LightSail-1, a 340-square-foot (32-square-meter) sail that will weigh less than 11 pounds (5 kg). Until the launch of the Japanese IKAROS spacecraft this year, no solar sail had ever been deployed in space primarily for propulsion. IKAROS has a solar-powered sail that uses the Ssun?s pressure for propulsion and embedded thin-film solar cells to generate additional power. The square sail with 33-foot (10-meter) sides was deployed and is kept flat because of the craft?s spinning motion and weights attached to its four corners. This is unique to the Japanese design, Friedman says, calling the mission a "great achievement and major step toward solar sail flight." The LightSail and NanoSail, by contrast, deploy their sails using a rigid mast or boom to which the sail?s blades are attached. This more traditional design tends to be heavier than the IKAROS design. Johnson says that the biggest challenge lying ahead for NASA engineers aiming to harness solar sail power is to make the booms lighter. The lower a sail?s overall mass, the more it accelerates from the Ssun?s force. Researchers are now looking for tough, lightweight materials for the support structure. Much as the explorers of the past used sails to search for new worlds on the uncharted seas, perhaps one day solar sail technology will allow humans to travel beyond our solar system and visit new and alien worlds elsewhere in our galaxy.